As some of you might have noticed, if you have the same addiction, I like a bit of Anthropologie. For those of you who don’t know Anthropologie you might be thinking, my goodness, doesn’t she know how to spell by now? Or, what does the study of comparative cultures have to do with flatbread? For the uninitiated Anthropologie, with an ‘ie’, is a fantastic clothing and home wares store full of well-crafted, unique items of lust. Yes, lust. These must-have, cleverly detailed and designed bits and bobs are displayed in such as way as to make you think ‘to hell with the budget, I’ll take it all’. A real credit card in flames kind of place. For me at least, but perhaps you as well. And I mention clothing, but really I can be found pushing past the dinky retro pinafores, peg-leg trousers (who, I ask you, looks good in those?!) and knee-length cobwebby sweaters straight for the ceramics, cutlery and glassware. I try and restrain myself from even entering its hallowed space because once in I’m as good as guaranteed to come out with one of their crispy white bags full of things I don’t need and for which I really don’t have space. Restraint when it comes to kitchenalia is not my forte. I don’t really give a fig for trendy clothes and I am curiously impassive about shoes, but present me with some oddly shaped recycled glasses on a kitchen table made from an old church pew, and I ‘m putty. My latest purchase is a sweet little rolling pin. Actually I did need a new pin, and this wasn’t pricey (which cannot be said for most of the clothes), so I thought, why not? Just because something (or someone) is a bit cute doesn’t mean it can’t be useful. Know what I mean? 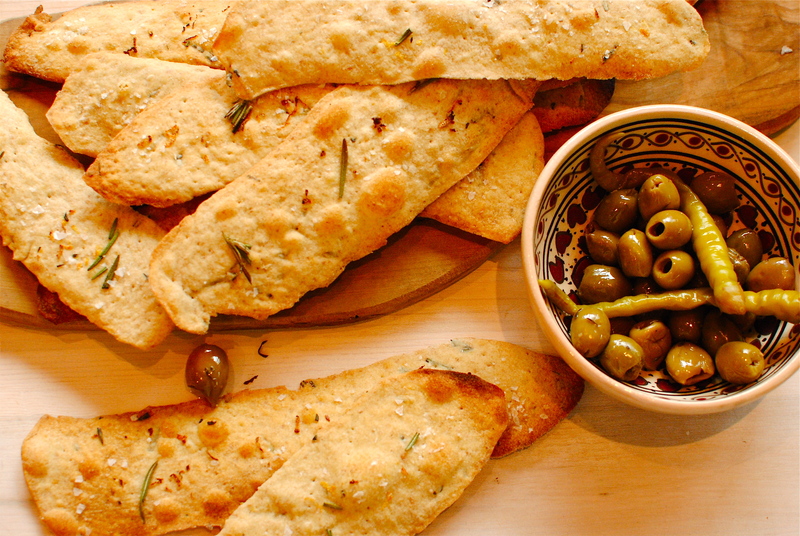 And I got to know my new best pin by making these light and crispy flatbreads. It was a great purchase – justify, justify – because the cool, stick-free ceramic rolls independently of the handle, making the rolling much easier and the resulting dough much thinner with less effort. And thin dough is the key to crisp flatbreads. That and a good amount of olive oil. Even a few tears are acceptable as it indicates a bloomin’ thin roll-out. In the near future I will do a wee post about the kind of kitchen tools and equipment I find the most useful (and beautiful), as well as some of the duffers that lie waiting for me to get to grips with eBay. In the meantime, anyone need an air-popper? These could not be simpler to make, both in ingredient choice and execution. 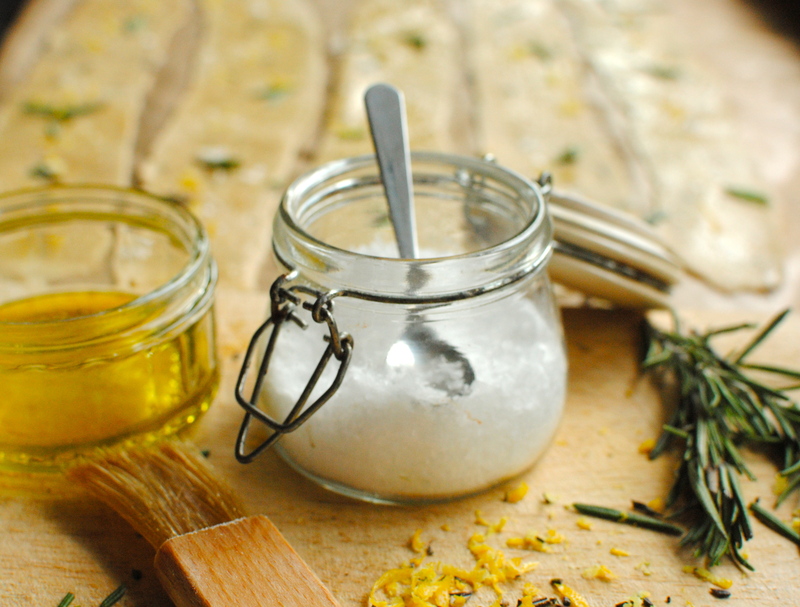 And I don’t need to tell you how amazing your house will smell – herbal heaven. Luckily they only take about eight minutes to bake. 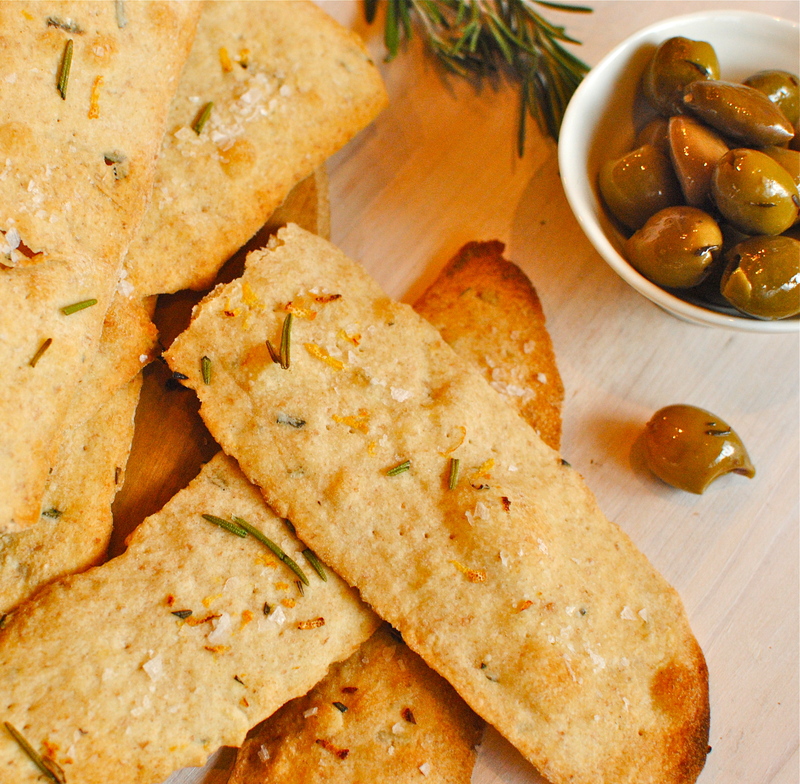 Great for family snacking or get-together nibbles with olives and roasted peppers. Have the hummus handy! Refined spelt flour is stipulated but feel free to use plain wheat flour, or a combination of wheat flours. And I used dark, peppery extra virgin olive oil but use what you have and like. As for the flavours, although rosemary and lemon is a classic combination, poppy-seed and crushed fennel seed is extremely moreish. As is black olive and rosemary. Crunchy sea salt is a must though. And lastly, on behalf of my gluten-free friends I did experiment with a g-f version but have to admit defeat – for the time being. If you have a great g-f way with crispbreads, would you please point me to a reliable recipe, preferably one using Dove’s gluten-free flour blend? If it’s from your own blog or recipe box, even better. I’d be happy to share the link. Pop the flour into a large bowl along with the baking powder and salt and give it a good going over with a large whisk. You can sift this of course but even unrefined flour has ‘bits’ in it that stay in a sieve. A large balloon whisk is my weapon of choice when sifting chunky flour. 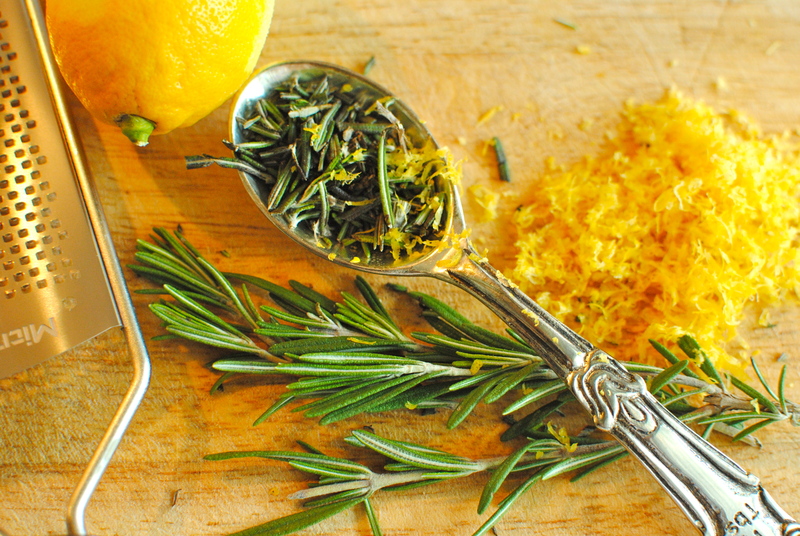 Now mix in ¾ each of the rosemary and lemon before making a well; pour in the oil and water. Stir well and then knead in the bowl a few times before turning out onto a floured surface to lightly knead 20 times. It’s not super crucial but I do think it helps to develop the gluten, even for a short time. Roll the dough into a rough cylinder, wrap in cling film and rest in the fridge for 20 minutes. Again, resting isn’t crucial but I do think it is worth doing if you have the time. Roll the cylinder into a sausage shape about a foot long and pinch off a piece roughly the size of a walnut (in its shell). Roll this nugget out as thinly as possible on a flour-dusted surface, flouring the pin as necessary. I aim for a longue shape but do a circle or whatever floats your boat: just make it THIN. You can even divide the dough into four pieces and roll them out poppadum style to share in the breaking and eating. Your first one may not be that thin but the next one will be better. Carefully lift and place each rolled piece onto a parchment paper-lined large baking tray, piercing each lightly and evenly at regular intervals with a fork. 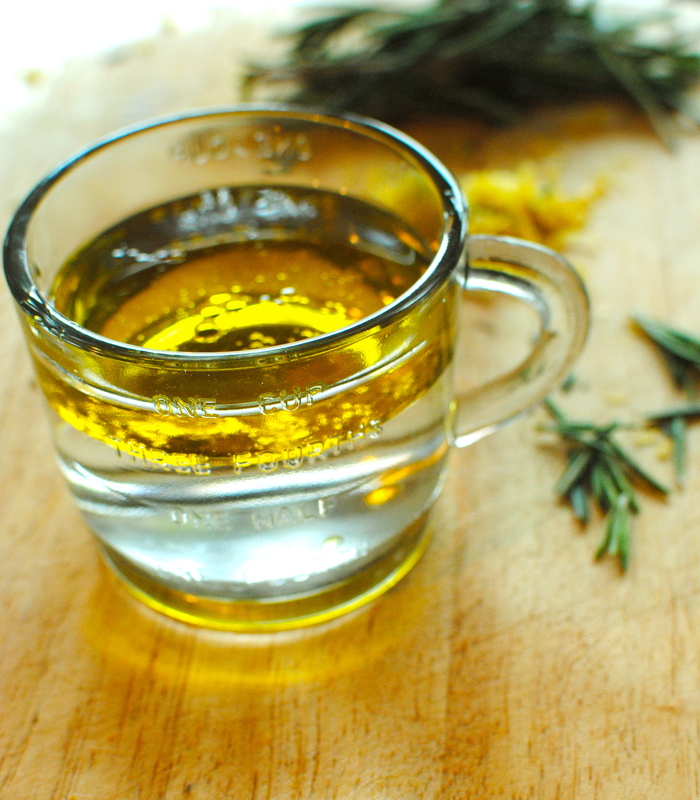 Brush with more olive oil (don’t be stingy), scatter over with sea salt, and a little extra rosemary and lemon zest. Bake in a hot (220C/425F) oven for between 8 and 10 minute. Watch carefully. You may get a few singed ends but that’s part of the charm of these (!). Remove carefully and lay on a baking rack to cool and crisp up further. Carry on with the remaining dough. These keep really well in a airtight container. But as with most baked goods, this theory is rarely put to the test. ‘scuse me while lick my screen…. I love the quote and I love Anthropologie too! Never tried making flat bread before but this looks easy enough. Thanks for another great post! everyday & even chuck them in the dishwasher. Oh man those look amazing. Nothing smells better than rosemary! I’m a huge fan of Anthro too, and your rolling pin is adorable! Hmm, I think my favorite kitchen tools are my Turkish coffee pot and French press pot…I love coffee, but also you wouldn’t believe how useful they are for other things! The flatbread looks wonderful, especially with hummus! What are the other uses for your coffee pots? Is a Turkish coffee pot the same as the stovetop Italian ones? I have one of those and it is so precious I have been known to to take it on holiday (at least driving ones – too heavy for Easyjet!). Thanks! The light was funny that evening, and as I don’t use photoshop (have it but don’t know how to use it!) the colour is off. But hey ho. I’m a health educator/teacher, not a photographer. Glad you like them though. 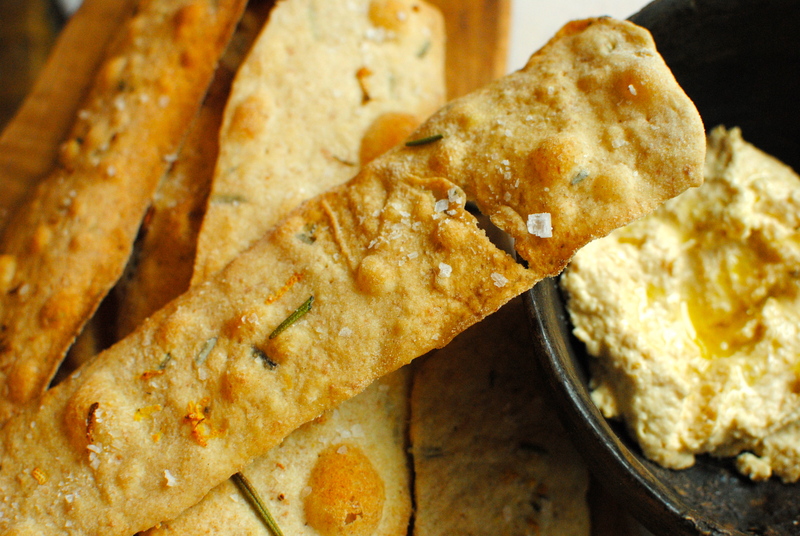 I am going to try and make this lovely looking flatbread this weekend to accompany some white bean dip. 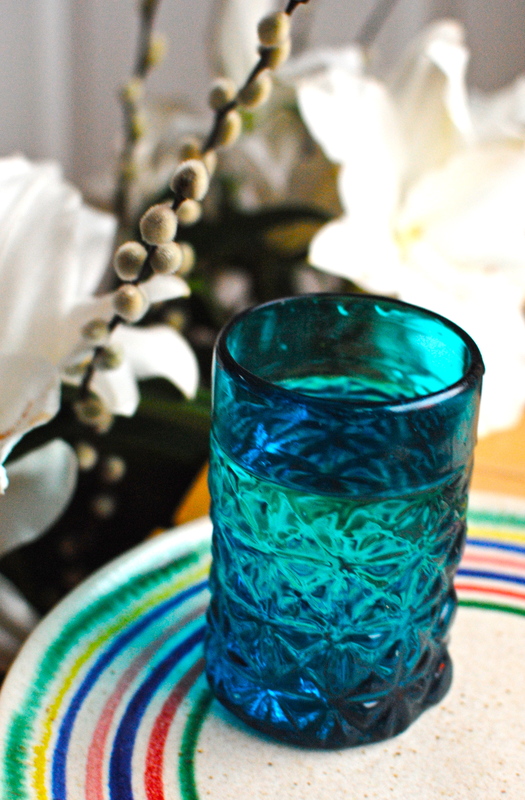 I also LOVE Anthropologie, my favourite piece is antique-type, floral gravy pourer – it brightens up the table. Love your recipes. I just saw this. Usually it’s vinaigrette for my salads! I make one with a mix of olive and sesame oils, grated ginger and garlic, mustard and a wee bit of tamari and a wee bit of maple. I know it sounds complicated, but it only takes a few minutes. Do you mean you mix the white bean dip with the cumin parsley and molasses? That sounds amazing. Hi Kellie, great post. Love the little treasures! I wonder if I could try these with gluten free flour? Am just starting to revisit a grain challenge I did about a decade ago. Health reasons… have various intolerances and now I think my cup runneth over again. Time for a recharge. gorgeous flatbread! I’ll have to try that sometime. 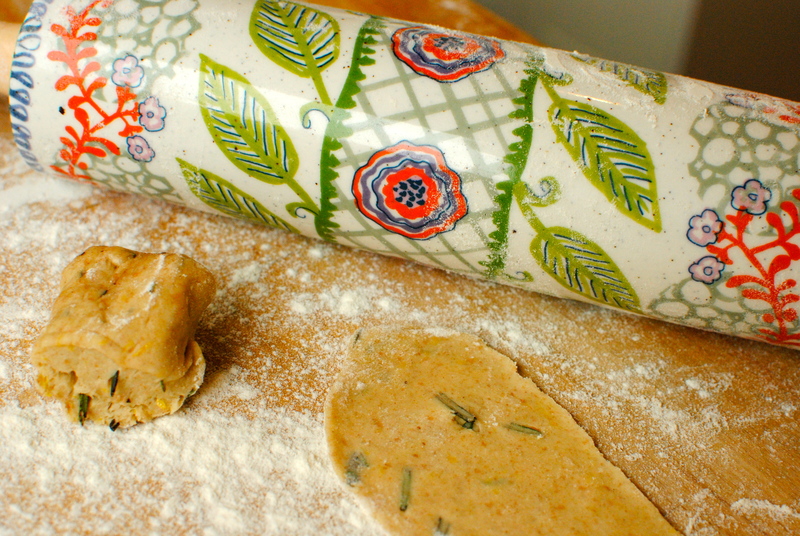 and that rolling-pins is toooooo pretty. Gorgeous photos and love your writing style. 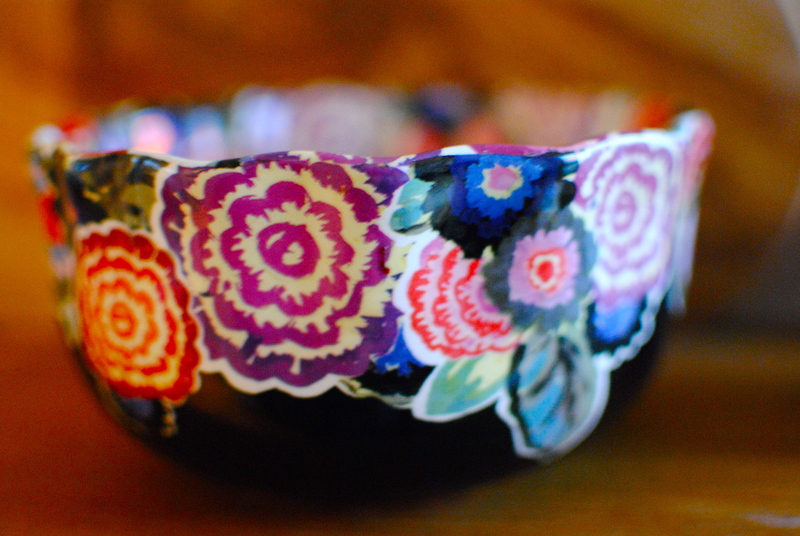 Also, suddenly feeling an urge to visit Anthropologie this weekend. Thanks on both accounts 😀 I am hoping Anthro will notice little old me & offer free stuff. I wish… What’s your favourite Anthro purchase ? Or ‘regular’ kitcheny purchase? That sounds very useful indeed. Of all the Lakeland products I’ve always fancied the Remoska. I picture a woman in a babushka masking a hearty stew in it. Don’t know why. Is your magic lid in all the catalogues? It really sounds good. Thanks for commenting, Daphne. I hope you are well. Ann & Aunt Trudy are over for afternoon tea on Sunday. Need to find the good china! I LOVE your rolling pin!! and I so want one!! I have a collection of pins, but this would be such a pretty one to display…and use!! I had plans to make flatbread this weekend. You have a great recipe here which I’ll definitely have to try! 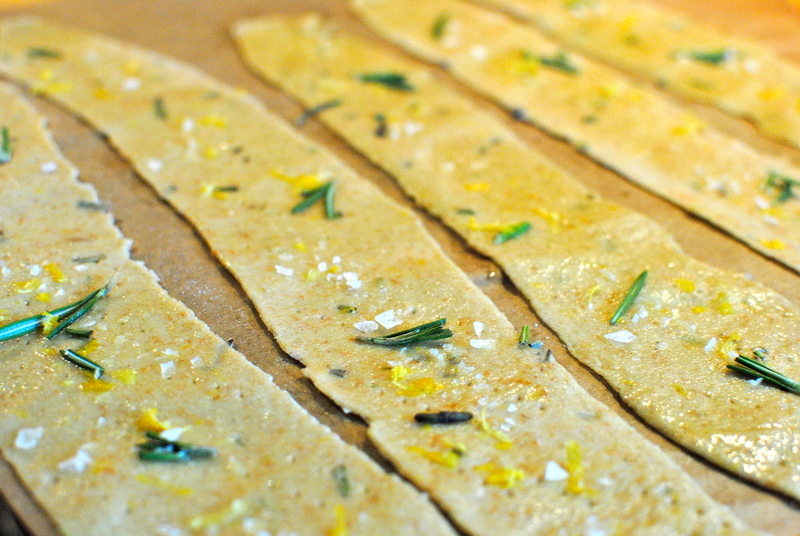 This flatbread recipe is deliciously addicting. Kellie made this for the kids and myself last month when she was visiting and it was demolished promptly. One of my favorite recipes! 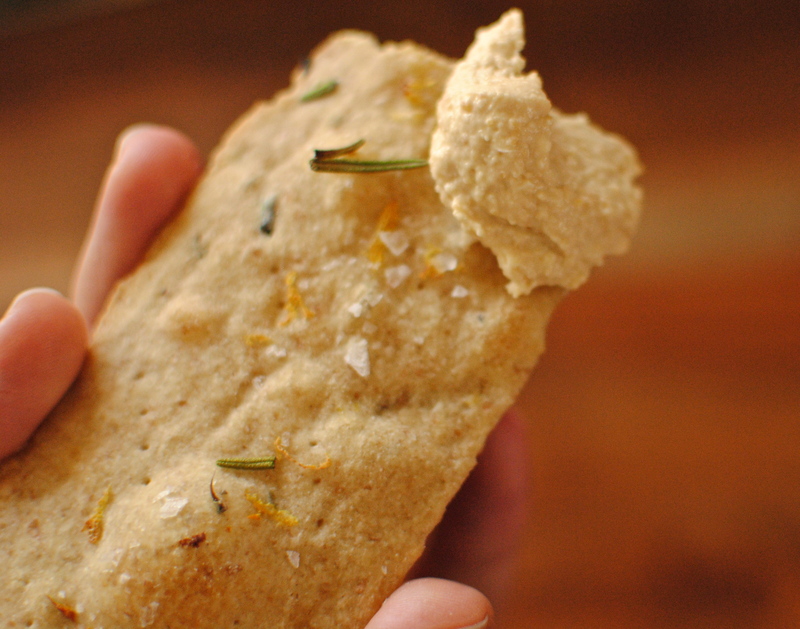 btw – we found your beloved pink comb…we’re holding it hostage for some more lemon-rosemary flatbreads. Anthropologie is so tempting! It is the only store that can easily keep all 3 generations occupied. My mother, my daughter and I always enjoy shopping at Anthropologie. Your flatbread is fabulous! I recently made whole grain crackers and was excited to find how easy they were to prepare. Oh yum – hand me a home made soup and some of these flat breads, and you’ll take my cold right away (currently under the weather). Love your pictures too. This looks so yummy! 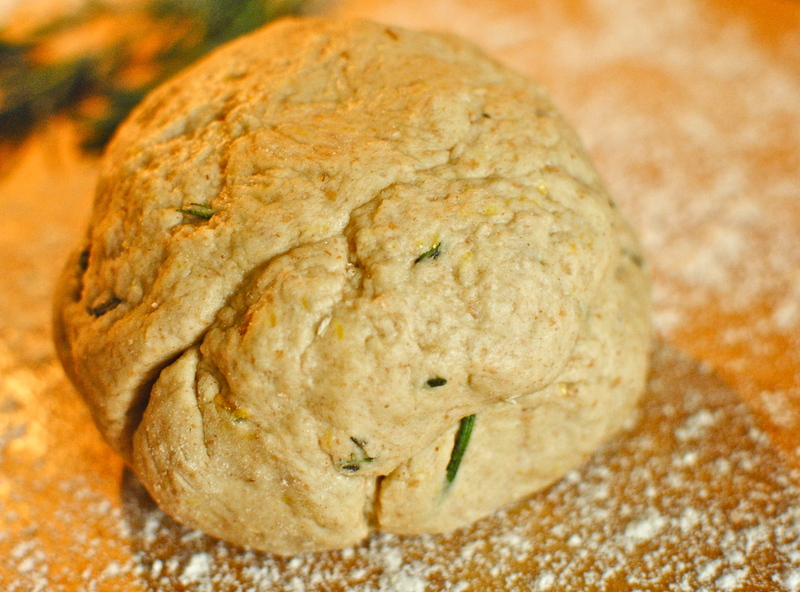 I have never had rosemary flatbread before, but I it looks delicious! I like to know your personal preferences with oils, like you said in your recipe, so that they turn out as delicious as possible. It doesn’t They look so fresh, and with some humus, I could eat this everyday!